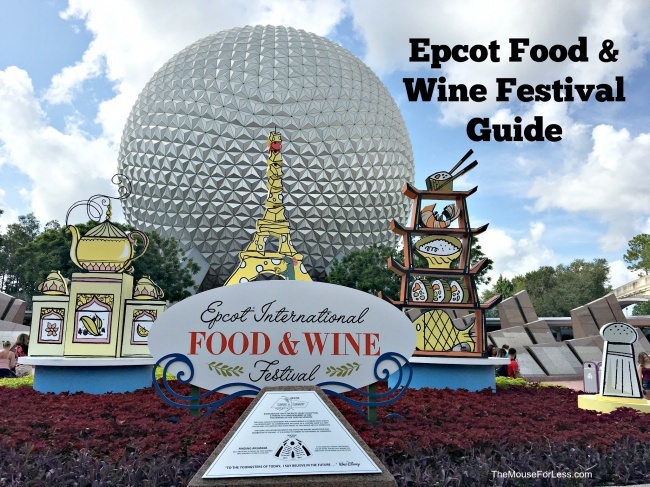 This annual event transforms Epcot into a food and wine lover’s paradise! Try delicious foods, wines and beers from around the world at special marketplaces set up throughout World Showcase. 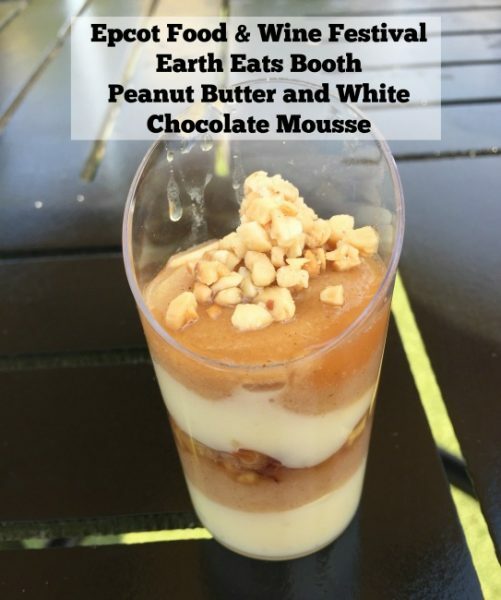 Growing in scope as one of America’s top food festivals each year since 1996, the Epcot festival, which is being held for 87 days (the longest number of days ever) will feature inspired sips and bites throughout the park’s World Showcase and Future World. Guests will have a chance to mix and mingle with celebrity chefs, experience hands-on culinary workshops and demonstrations at the Festival Center, and get their gourmet groove on at nightly Eat to the Beat concerts. You won’t want to miss it! Additional details about the 2019 Epcot Food and Wine Festival will be added as released. Check out the 2018 food booth menus and photos! The Epcot International Food and Wine Festival is slated to run for 75 days this year! The 2018 Epcot International Food and Wine Festival will take place from August 30 through November 12, 2018. Celebrity Chefs – Appearing for the first time during the festival are Chad Johnson, Daniella Malfitano, Jet Tila, Kim Yelvington, Shaun O’Neale, Stephanie Hersh, and Stuart O’Keeffe. They will join longtime favorites Art Smith, Robert Irvine, Cat Cora, Buddy Valastro and Jamie Deen. New Eat to the Beat acts –The stars are out… and lighting up the stage! New additions to the Eat to the Beat Concert Series include MercyMe, Glass Tiger, Tauren Wells, Vertical Horizon, Sheila E, Jim Belushi and the Sacred Hearts, 98 Degrees, and High Valley. Returning favorites include Sugar Ray, Boyz II Men and Hanson. See the complete line-up on our Eat to the Beat Concert page. Character Dance Party on Friday and Saturday evenings where kids can enjoy an interactive atmosphere as they dance and play along with Disney Characters. Junior Chef Kitchen. Here Children become chefs and get to eat what they make in this family-friendly, complimentary experience every Sunday at the Festival Center. Food and Beverage Pairings – on Fridays, Saturdays and Sundays at 2:30 p.m., learn from top food & beverage industry pros. Best of all—taste the demonstrated dish and beverage pairing! 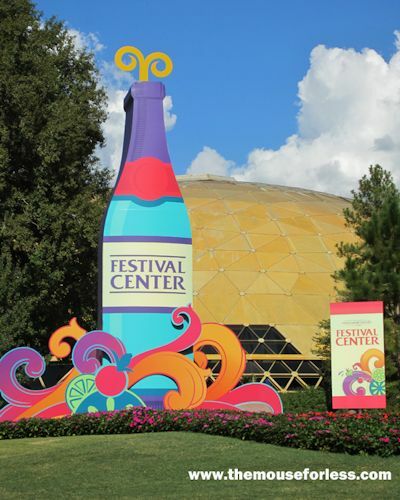 The Epcot International Food and Wine Festival begins with the Festival Welcome Center. Located in the former Wonders of Life Pavilion in Future World (between the former Universe of Energy Pavilion and Mission: SPACE), the Welcome Center is open daily from 9:00 a.m. until park closing. Here, guests can enjoy Culinary demonstrations, Beverage seminars and mixology seminars for a nominal fee. Plus, look for Premium Events such as the Beverage Seminars, Cheese Seminars and more. The Welcome Center keeps a list of the famous personalities who will be appearing plus the times of their scheduled book or bottle signings. 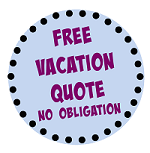 If you don’t have a reservation for an event, but would like to check availability of these different events, visit the check-in desk to see if there is any last minute availability. The Festival Welcome Center is also the place to pick up Festival keepsakes such as a limited edition Festival pin, cookbook or unique wine. Or, just kick back and relax at the Intermission Cafe, featuring a fine selection of wine, cheese, sandwiches and salads. International marketplace food kiosks serve up regional specialties beginning at 11:00 a.m. each day of the festival. Countries feature their most mouthwatering foods and beverages! This year, 35 Marketplaces serve tapas-sized portions which range in cost from about $3 to $8. Each kiosk offers suggested pairings of beer, wine or cocktails. To enjoy the shortest lines, get there at opening (11:00 a.m.), before the lunch crowd, and avoid the weekends when the lines can get impossibly long! Typically, the lightest crowds will be Monday through Thursday. To save time, plan your visit by checking out the menus for each kiosk. To save on your feet, remember to pace yourself; it’s 1-1/3 miles around World Showcase, so take it slow and enjoy some of the entertainment offered at individual pavilions in between sampling Marketplace offerings. And, to get the most from your food budget, consider picking a few extra choices and sharing menu items with others in your group. A complimentary Marketplace Discovery Passport is available to be stamped at each international marketplace visited for the perfect scrapbook souvenir. Each marketplace has its own unique stamp design. Visit the Festival Welcome Center or ask at the Marketplaces kiosks to receive your Marketplace Discovery Passport. It’s a great way to remember what you ate! You can also pick up the limited release Festival Gift Card. This can be found at merchandise locations throughout the park, including the Festival Center. 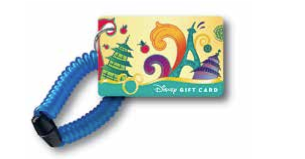 With a $250 activation, you’ll receive a specially themed lanyard and medallion. Snack your way around the World with Disney Dining Plan Snack Credits! Snack credits can be used to purchase select food items at international Marketplaces around World Showcase during the Epcot Food & Wine Festival. Look for the Disney Dining Plan Snack Symbol to identify snack items available with Disney’s Dining Plan snack credit. 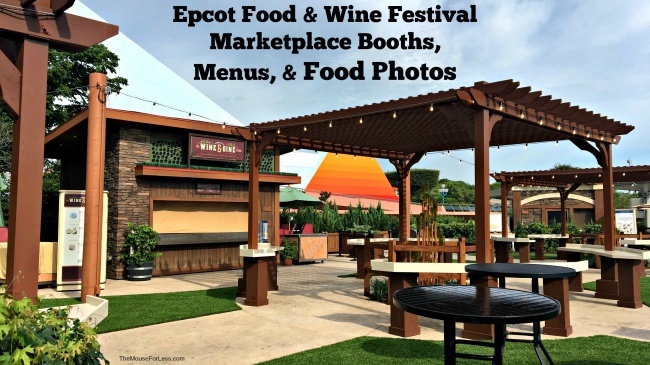 While much of what the Epcot Food & Wine Festival has to offer is complimentary with your park admission, some events require that you reserve and pay for them in advance. Guests can call 1-800-WDW-FEST (939-3378) to make reservations. Book your events as early as possible! Some popular events sell out within minutes of phone lines opening. Before and after the Epcot International Food & Wine Festival, you can find merchandise that celebrates the annual event. While you’re in the park, visit the Festival Welcome Center, which offers commemorative gifts, specialty kitchen items, a book shop and a wine bar. You’ll also find the official Epcot International Food and Wine Festival Poster at the Festival Center. The new Epcot International Food and Wine Festival Cookbook has recipes from around the globe including Marketplace favorites and specialty beverages, recipes from culinary demonstrations and Party for the Senses. 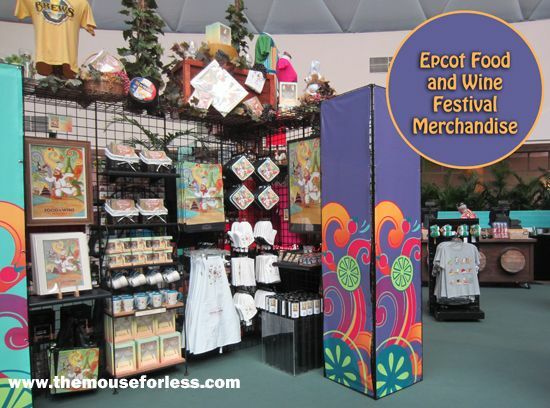 You can also visit the shops located around World Showcase Promenade for additional Festival merchandise offerings and artisans. Musical entertainment pairs perfectly with culinary fun during the nightly Eat to the Beat! Concert Series. Enjoy a varied lineup of classic rock, soul, R&B, jazz and funk hit-makers! Concerts are FREE with Epcot park admission and are held at 5:30, 6:45, and 8:00 p.m.! Take a look at the full concert line-up here. Run around the parks, dine around the World November 1-4, 2018! Join runDisney for the Disney Wine & Dine Half Marathon, which features a brand new challenge and more! Plus runners and their friends will be able to enjoy a private after party at the Epcot International Food & Wine Festival! Everyone will enjoy this scavenger hunt for Remy statuettes hidden around World Showcase. 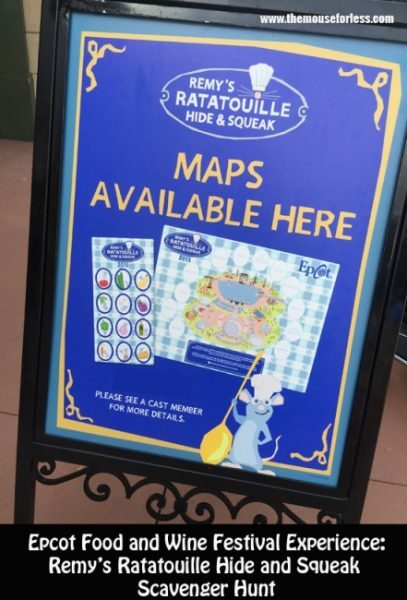 The goal is to help Remy as he ventures around World Showcase collecting ingredients for his signature dish, ratatouille. Use the World Showcase map to locate the statues, mark your location with a sticker, and even receive a prize. You will then use the map to record your discoveries while helping Remy, by placing the corresponding ingredient sticker on the map. To get a glimpse of the scavenger hunt, make sure to read this review on The MFL Blog. Redemption location: Port of Entry (Plaza Towers). Map does not have to be completed to redeem prize. 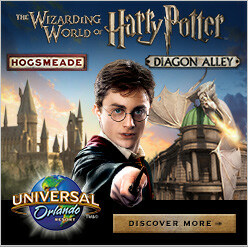 Theme park admission is not included, however is required to participate. Maps/stickers and surprise available while supplies last. Information subject to restrictions and change without notice. During this tour, Guests will take in depth look at the Epcot Food and Wine Festival. While enjoying the tour, Guests can immerse their senses in the world of edible trees, shrubs and flowers all while giving Guests the chance to study the various gardens of World Showcase with a Disney Horticulture expert. Guests will examine the various edibles indigenous to each country. Not only will you learn during the tour, but you’ll be invited to delight in their unique food and drink and learn different ways you can adapt growing techniques in your own garden! 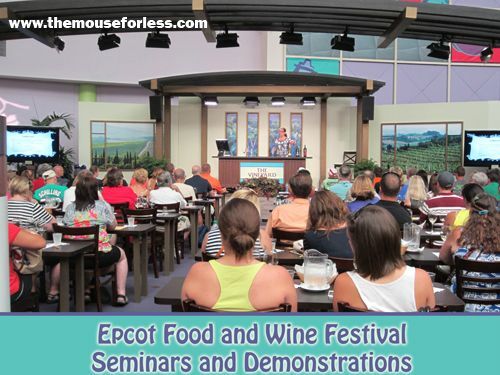 Days & Times: Tuesdays, Thursdays and Fridays from 9:00 a.m.to 12:00 p.m. during the Epcot Food and Wine Festival. The Walt Disney World Swan and Dolphin showcases a passion for food and beverage during the Annual Swan and Dolphin Food & Wine Classic. Elevate your knowledge of wine appreciation in a series of beverage seminars or just enjoy great food as your stroll the Causeway. Live entertainment is included. Typically, Epcot park remains open until 10 p.m. on both Friday and Saturday nights during Epcot International Food and Wine Festival. Additionally, IllumiNations: Reflections of Earth moves to an hour later, taking place at 10:00 p.m. rather than 9:00 p.m. Parking at Disney’s Yacht and Beach Club Resorts lots will be strictly limited every Friday, Saturday and Sunday during the Epcot International Food and Wine Festival. Only the following guests will be permitted to park during this time period: resort guests, those with confirmed dining, recreation or spa reservations, and guests attending a wedding or convention at Disney’s Yacht and Beach Club Resort.